**WARNING** Try at own risk!!! 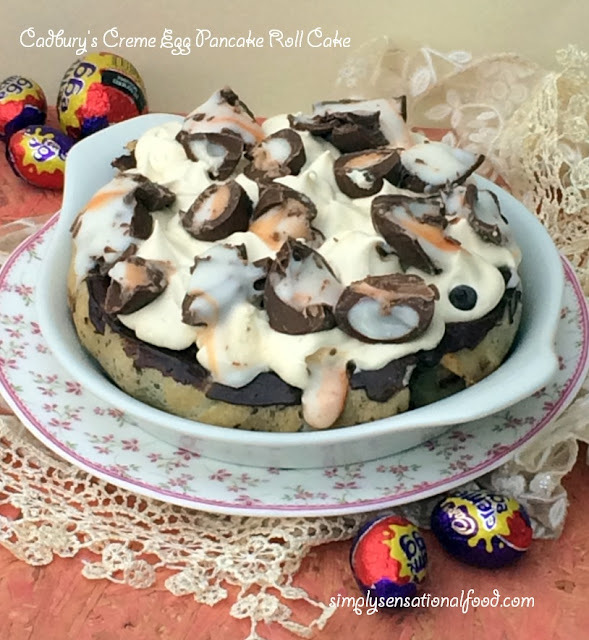 :) This cake is not for the faint hearted.You have to have a serious sweet tooth, have a genuine love affair with Nutella, chocolate and Cadbury's Creame Eggs!!!! A small slice will go a long way especially round your waist!!! Eggless crepes rolled with nutella, topped with fresh cream and Cadbury's creme eggs. 1. Sieve together the flour, salt and baking powder and keep aside2.To the flour add the sugar, vanilla, melted butter and milk and make a thin batter. Cover and leave the batter to rest for 20 minutes. Transfer the mixture into the OXO pancake batter dispenser for easy pouring.3.Spray the frying pan with sunflower spray and wipe surplus off with kitchen paper.4.Place the frying pan to warm up and pour a thin layer of batter into the frying pan, swirl the pan around until batter is thinly spread and covering the whole pan. Wait for bubbles to form and them flick the pan cake and cook underside.Repeat for all batter and keep pancakes covered whilst making more.To Assemble your pancake cake. Whip up the double cream until it's stiff peaks and fill up a piping bag with a star nozzle.2. 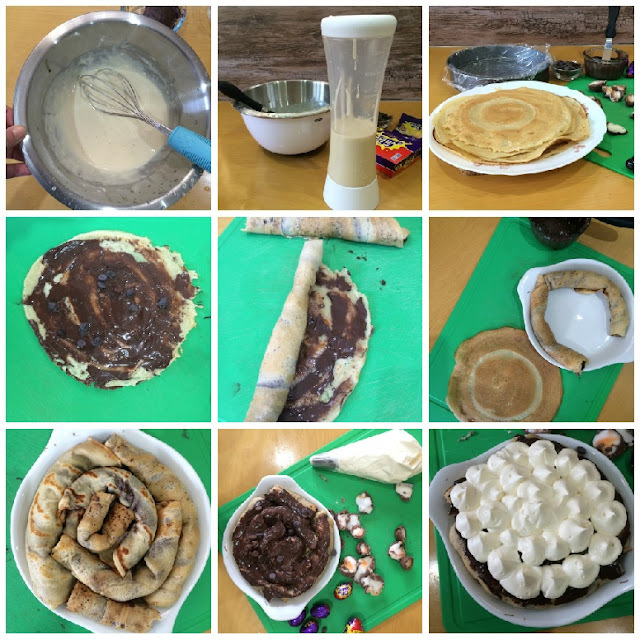 Lay a pancake on a flat surface and spread with nutella, sprinkle with a few chocolate chips. Roll up the pancakes and arrange the pancake in a spiral in a serving dish. Make all the pancakes in this way and keep adding them to the serving dish in a swirl until the whole dish is packed with pancake swirls.Spread a little more nutella on the top and sprinkle some more chocolate chips on top.Pipe some fresh cream rosettes on top and then decorate with some chopped up cadbury's creme eggs, letting the insides ooze out.Chill and serve. 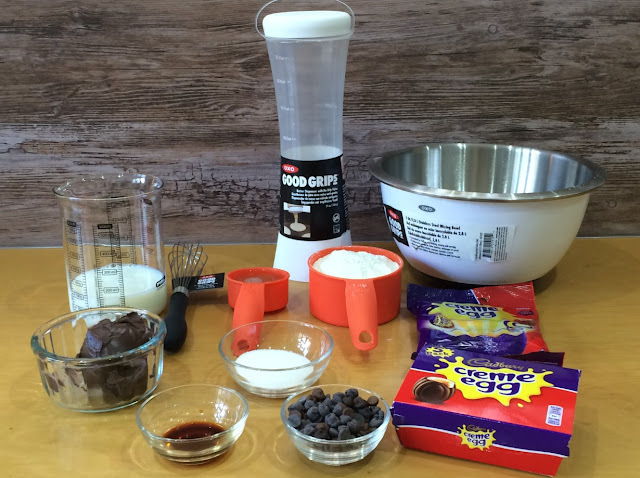 The pancake batter dispenser, the stainless steel mixing bowl and the 9 inch balloon whisk featured in this post are all available from Oxo and they would make ideal utensils to have in your kitchen for baking. I was sent the samples to review by OXO, all the opinions are my own. My little girls would love to make this. Thanks for posting. Oh my goodness! My mother in law would love this! Unfortunately I'm not a fan of creme eggs so I could maybe switch it for a caramel egg but wow what a cake! That is fantastic especially for people who can't eat eggs but still want to eat pancakes! Love the warning that comes with this cake! Oh wow! A cake like this is my dream but also my nemesis!! I'd devour it but feel so guilty afterwards!!! Ooh yum yum yum!!! That looks so delicious and perfect for this week! This looks stunning! It made me smile - so many of your usual delicious recipes look so healthy. You've definitely earned something that's gloriously naughty, like this! Wow, that just looks awesome. My cravings would totally be satisfied with this! This looks quick and easy to make. Just what I needed. Thanks for sharing. Oh my goodness, this has to be one of the most delicious looking things I have ever seen! Oh my god! Three things I absolutely love - chocolate, cake and pancakes. I NEED TO TRY THIS! Wow - this is more like a cake rather than pancakes. Must taste amazing chocolate filling and topped with cream. Oh wow, this looks divine although I think it may be a bit too sickly for me but my youngest would love it! 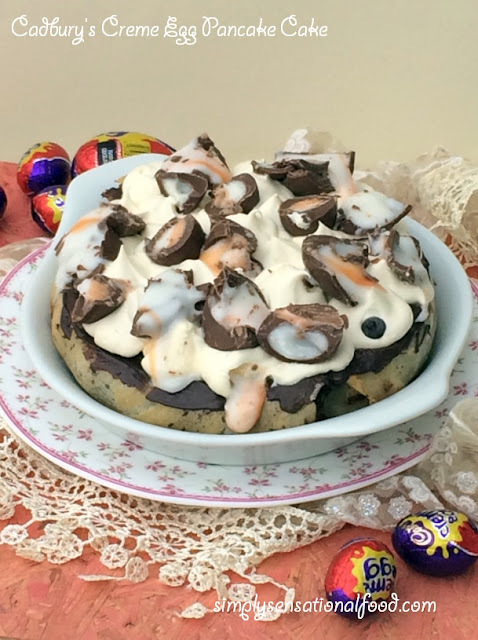 Love creme eggs - this looks amazing! Oh. My. Word. This looks and sounds absolutely amazing. I'm a huge Cadbury's egg (and Nutella!) fan so I'm sure I'd have no trouble devouring this. Not all of it mind! Must have been so hard to make, I'd be tempted to snack along the way!